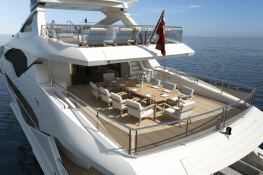 The Sunseeker 131 Yacht, Jacozami has five elegantly decorated cabins for ten people. Jacozami is the ideal yacht to charter from Corsica and the South of France for those looking for an elegant and modern cruise. The cabins are appointed with comforting luxuries and have the most beautiful bathrooms. 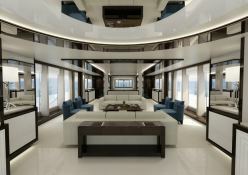 On the main deck there is a large seating area centered around a coffee table for cocktails and conversation. The interior lounge has full-height windows flooding the room with light and offering an unobstructed view of the sea. A large dining room is located just in front of it. 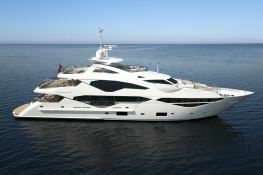 The crew on this Sunseeker consists of 8 people. Thanks to their experienced skills you are guaranteed to enjoy unforgettable moments in the Mediterranean around the island of Beauté and Sardinia. On request, this yacht is also available for charter in the Balearic Islands, on the French Riviera and on the coast of Tuscany. 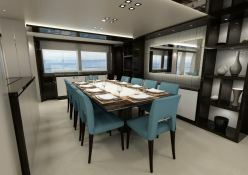 This Jacozami is available for yacht charter with a base price of 158 000 € (approximatly 178 185 $).